Most golfers understand that wedges differ by loft - typically from a 45 degree pitching wedge up to as high as 64 degrees for the most extremely lofted lob wedge. But what about the bounce angle? 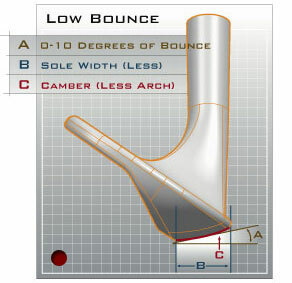 As the name implies, the 'bounce' (in layman's terms, the curvy bit on the sole of the wedge) enables the head to 'bounce' out of the sand or rough without snagging. On a sand wedge, for example, you'll see that the trailing edge hangs below the leading edge. Take a club and put in the address position and you’ll see a space between the ground and the leading edge of the wedge. High space = High Bounce angle. The most bounce you'll ever see on a wedge is about 18 degrees - but it can be as low as 2. Doesn't amount to a hill of beans we hear you say. But there you'd be wrong. Using a wedge with the right combination of bounce and loft for the sort of course you play and the sort of swing you have can make a big difference to your short game. So how do you decide what’s best? Here’s a quick guide – with thanks to Cleveland golf for the imagery. Low Bounce Wedges are ideal for shots from tight lies and firm turf conditions. The combination of less bounce and narrower sole-width lowers the leading edge of the blade to promote a clean contact. Perfect for players who like to be creative around the greens and in the bunkers and who have shallow attack angles through impact. Less bounce and narrower sole width make it easier to open the face and hit high, soft landing flop shots. Low bounce wedges are typically in the lower loft range – eg pitching and gap wedges which are used for longer approach shots. A lot of bounce would be undesirable because it would make it more difficult to get the leading edge under the ball, causing you to ‘thin’ it. Golfers who strike down at a sharp angle can put a lot of back spin on the ball – and may benefit using wedges with very little bounce (less than 8 degrees), but they are a minority of golfers. As a rule, most golfers are better off with more bounce (10 to 14 degrees), not less. 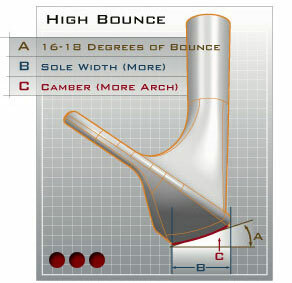 High Bounce wedges are designed for play out of soft turf and sand. The combination of the wider flange and higher bounce angle prevent digging and create a smoother gliding action of the sole along the ground. Works exceptionally well out of (soft) sand for players who prefer to keep a square face through impact. High Bounce wedges are also a good choice for players with steep attack angles. High bounce wedges tend to be associated with higher lofts – but this certainly isn’t always the case. For example, lob wedges (60-64 degree) which throw the ball very high for soft-landing ‘pop-up’ shots around the green (Phil Mickelson’s speciality) tend to have low bounce because even the smallest error can make the club ‘bounce’ off the ground and cause a ‘thinned’ shot. You know the sort well – instead of gently throwing the ball 10 feet in the air and plopping it by the pin – it travels at warp speed a few inches above the ground, lodging deep into thick bushes 50 yards behind the green. Lob wedges tend to have less sole width and a sharp leading edge. Most of the specialist wedge manufacturers like Cleveland and Titleist will actually state on the club what the bounce is (eg a Titleist Vokey 248.06 model indicates 48 degrees loft, 6 degrees bounce). Otherwise, the options are to (a) refer to the manufacturer’s website or (b) ask us here at Golfbidder – we’d be happy to advise.